...followed by an optional extension to lovely Mykonos. Revered throughout the western world as the birthplace of science, philosophy, theatre and democracy (and so much more), Greece has produced many of the ancient world's most brilliant individuals and ideas. The country's winding path through history has endowed Greece with a legacy of archaeological and architectural jewels that span over 3000 years! Greece's history is layered like few others – from the Neolithic Period (when the first permanent settlements were established) to the Bronze Age and the Homeric Age (during which the first Olympic Games were held), to the Classical Period (when Athens and Sparta fought for dominance), followed by centuries of Roman rule. Starting in the 1400s, Greece was part of the Ottoman Empire for over 300 years. It wasn't until the Greek War of Independence in the early 1820s that the nation finally freed itself of foreign intruders (except for the German occupation during World War II). 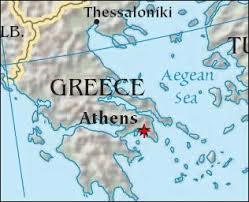 Greece is a member of NATO and joined the European Community in 1981. Since the Renaissance, the legacy of Classical Greece has been at the foundation of European culture. But Greece is more than a storehouse of antiquities. It's a travel destination offering the visitor a delightful climate and great natural beauty — award-winning beaches, sweeping seascapes, mountains, delightful villages, countless inviting islands. There's a savory and robust Greek cuisine. Food here is healthful and delicious, not only because recipes have been perfected by generations of talented cooks, but because Greek dishes are based on fresh, local products. There's the wonderful Greek music. Wander through the streets at night and you'll hear it everywhere. Greeks don't mind how late it gets…the bars and discos are open to the wee hours and the welcoming atmosphere and camaraderie just keeps on rolling. It's a spectacular country and, because it's a Carpenter travel program, all the details are taken care of: ultra-luxurious accommodations, unforgettable sightseeing, and delightful private social events. Greece is a favorite destination. Its incredible historic sites span four millennia. Its coastline is punctuated by superb beaches. Greece's island resorts are second to none. And, of course, there's the superb cuisine and never-ending nightlife!